Does Andrew Lincoln have what it takes to be your Walking Dead hero? The Walking Dead's Rick Grimes is one of the greatest post-apocalyptic heroes. 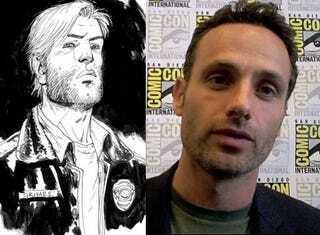 Does Andrew Lincoln have what it takes to play him? Let the actor himself explain to you just how far he's willing to go for the character. Why did you want to be Rick Grimes? He's a man, he's an everyman. Some of my biggest idols in film, Jimmy Stewart and Gary Cooper. I really responded to him when I read the graphic novel and said, "He reacts in a way I would want to react under those circumstances." And for the same reasons that I would react — for family. He's not your archetypal hero, a lot of it is he's just driven into a corner. And also I'm from London. I never get to wear a cowboy hat or I got no horse. What's been the most harrowing filming experience so far? You guys don't stay 100% to the comic but there are certain pivotal things that have to happen to your character that you know going in. Horrible, terrible things. Going into that how do you prepare for [this part], knowing part of you could be augmented for the rest of your character's life? AMC are brilliant because they give space to character. And that's one of the great things that I've really liked in the four episodes we've shot. It's that they really care about that evolution. The great thing I loved about when I read the novel is it It feels like he's eroding. This great sort of decent honorable guy, by circumstance gets eroded. And there's nothing more exciting for an actor to play such high stakes scenes. Such life or death scenes in such a heightened world. It's a dream come true this is what we trained to do. So if you had to work an entire season with one hand it would be no problem? Chop it off! You know. Of course I would.